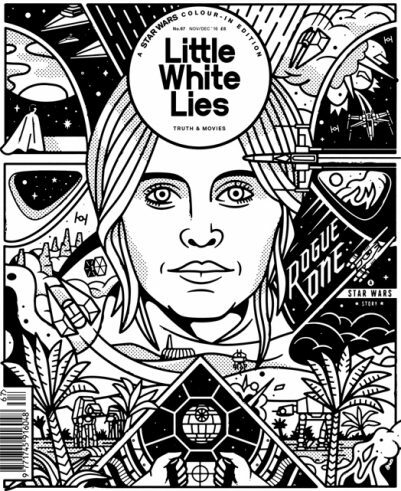 Gather up your colouring in materials as Little White Lies takes a deep dive into the world of Gareth Edward’s world-expanding Star Wars escapade, Rogue One: A Star Wars Story. For this issue we want you to help us bring a splash colour to this magical universe, which is why we’ve made it so you can put your own creative, personalised stamp on the cover artwork and every single illustration inside the magazine. But why? From its very origins, the Star Wars saga has used black-and-white in subtle, imaginative ways. Imagine if Darth Vader’s body armour had been white? Or if Luke Skywalker embarked on his date with destiny dressed in black robes? The clash of opposites embedded into the fabric of the films is what makes them so dramatic, so relatable and so iconic. Some may still know her a Britain’s foremost Chalet Girl, but Felicity Jones is now bringing some major dramatic credo to the Star Wars universe. Words by David Jenkins. In 2006, the co-founding editor-in-chief of Filter magazine Gregg LaGambina got on the phone with the comedy legend Gene Wilder to discuss his life and work. 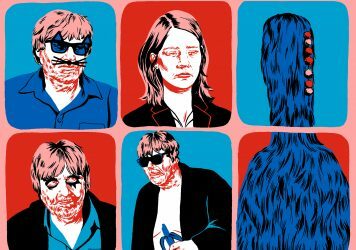 In the wake of his recent demise, we reprint their wonderful, career-spanning interview in all its original glory. 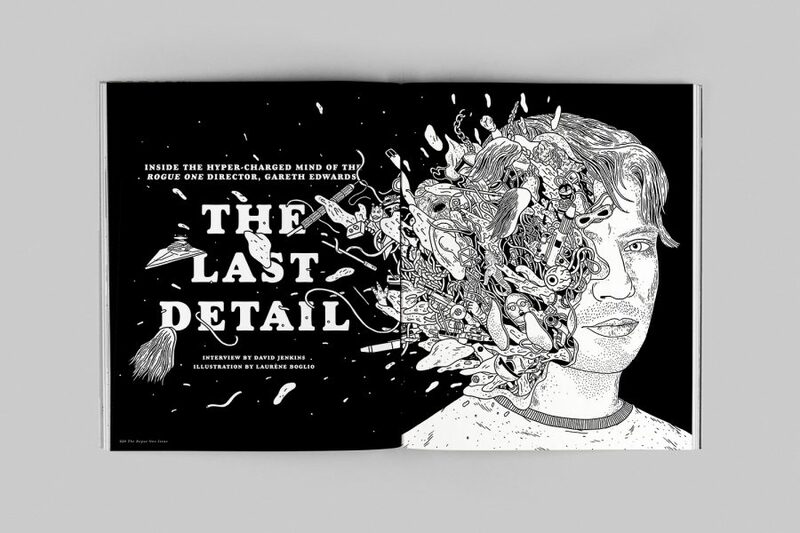 Paterson director Jim Jarmusch interviewed by Zach Lewis; Black Mirror writer Charlie Brooker interviewed by Michael Leader; Fantastic Beasts costume designer Colleen Atwood interviewed by David Jenkins; The Unknown Girl star Adèle Haenel interviewed by David Jenkins; Bleed for This director Ben Younger interviewed by Adam Woodward. Lo and Behold: Reveries of the Connected World by Sophie Monks Kaufman; Tom Ford’s Nocturnal Animals by Manuela Lazic; Creepy by Glenn Heath Jr; Spike Lee’s Chi-Raq by Adam Woodward; the Dardenne brothers’ The Unknown Girl by Trevor Johnston; Girls Lost by Lauren Thompson; Francofonia by David Jenkins; United States of Love by Lauren Thompson; Le Fils de Joseph by David Jenkins; Jim Jarmusch’s Paterson by Sophie Monks Kaufman and Gimme Danger by Josh Slater-Williams; A United Kingdom by Phil Concannon; Ewan McGregor’s American Pastoral by Elena Lazic; A Street Cat Named Bob by Elisa Adams; The Wailing by Anton Bitel; Denis Villeneuve’s Arrival by Adam Woodward; The Innocents by Poppy Doran; Life, Animated by Ewan Cameron; Richard Linklater: Dream is Destiny by David Jenkins; Bleed for This by David Jenkins. 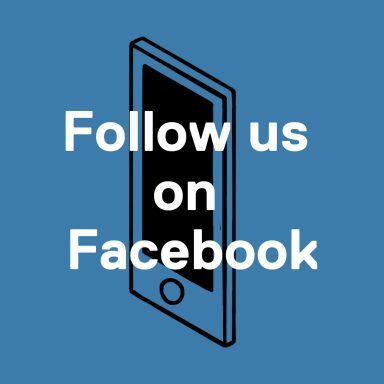 Order your copy today via our online shop. 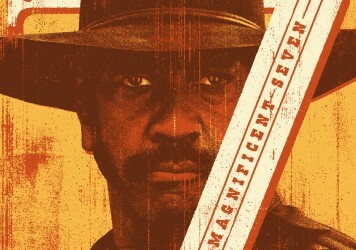 Saddle up with our epic Stetson-tip to Antoine Fuqua’s gritty western remake. Elle Fanning sheds her squeaky clean image for Nicolas Winding Refn’s beautiful dark twisted fantasy.